Eye Movement Desensitization and Reprocessing (EMDR) is an integrative approach to working with trauma that has been extensively researched and proven effective for the treatment of myriad diagnoses and symptoms including post-traumatic stress, obsessive-compulsive disorder, depression, panic and anxiety, grief and more. READ: In layman’s terms, doing EMDR helps deactivate triggers that lead to feeling anxious. Most people notice the absence of symptoms and behaviors as the first outcome of EMDR. One client recently referred to EMDR as “magic.” The results can be amazing and seem magical, while the practice is evidence-based from research. It is a difficult process to explain, but simple to do. While once limited to eye movements, the acronym EMDR is now used to refer to all the ways the therapy is delivered: through eye movements, hand buzzers, or audio headphones. To put it simply, EMDR works to alternately stimulate both sides of your brain while I, the therapist, guide you through a series of steps to address the memories causing distressing beliefs and symptoms. The goal of EMDR therapy is to transform negative beliefs that formed as a result of the trauma into positive beliefs that help maintain safety, control, and worthiness. For example, you may experience intense fear when faced with a certain set of circumstances you but you don't know why. Or you have a panic attack when getting on an airplane, even though you've never flown and don't know why you're afraid. These are the types of problems EMDR can help, but EMDR can really be used for any distressing feeling. The idea is to resolve current distressing symptoms by reprocessing related memories from the past (that may not seem related at all at first), and planning on how to address the situation in the future. I chose to get trained in EMDR because of the undeniable results it provides. 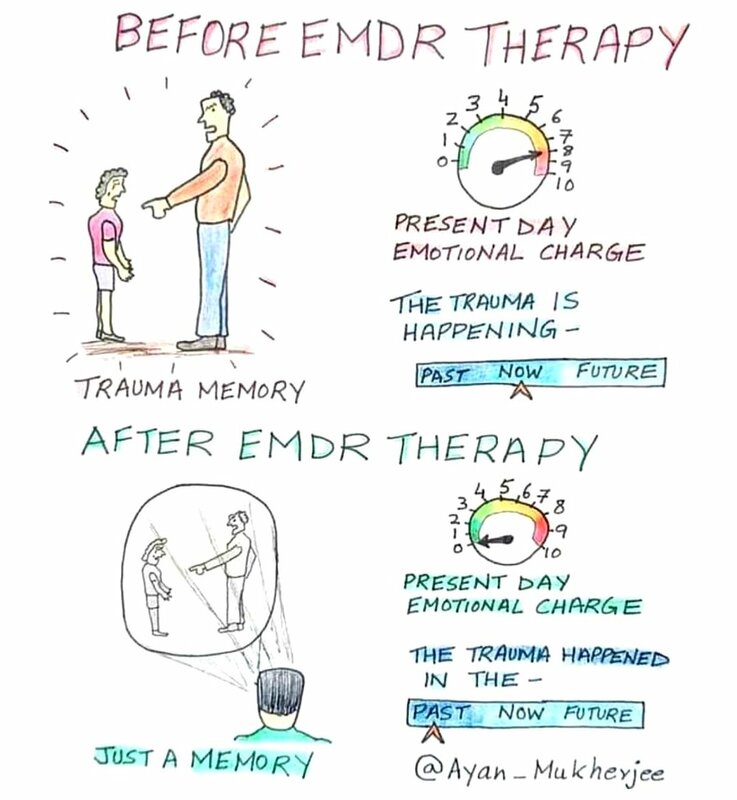 While different from talk therapy, EMDR therapy integrates both the technical parts of EMDR with talk therapy in a way that is unique to each person. Many different types of theories and approaches can be used with EMDR such as attachment-based EMDR, Ego State Therapy, and Dynamic Needs Meeting Strategy (DNMS). Results vary from person to person. Everyone’s experience with EMDR is different. There is no way to predict how long it will take to work through the traumatic memories, as it depends on many variables. Once you schedule an appointment, we will create a plan that is specific to your symptoms and needs.